Everyone wants to be part of the team. Competition for places is fierce and as a result, incumbent players are highly motivated to ensure they consistently perform at a high level. To overcome each upcoming opponent, the management team use reams of data to inform their strategy and they then painstakingly practise, rehearse and run through various drills to counter the scenarios and situations they expect to face in their next match. For 16 games in a row, this meticulous approach to practice had been a winning formula and for the next game against Italy, there was little reason to doubt its effectiveness. Few gave Italy a chance. They had never beaten England and were low on confidence having lost by over 50 points in their previous game. Italy would have to do something pretty extraordinary to have any chance of stopping England increasing their winning streak to 17 games. Halfway through the match, the underdogs were winning. England were rattled, their star players were panicked, confused and clearly struggling to deal with Italy’s strategy. Why? In short, because Italy implemented a unique tactic that had rarely been seen on a rugby field before. Yes, their novel approach pushed the rules to the limit  but the approach was perfectly legitimate. Those watching at home and from the stands were equally confused by the tactic (can they do that?!) but perhaps what was more surprising was England’s reaction – or lack of it. How could this be happening? How could a team of experienced coaches and players, who have played the same game for hours a day, over many years not know how to solve the problem? In our view, this is a prime example of a phenomenon that has been known to affect high performing individuals: when intuition overrides the ability to think critically. 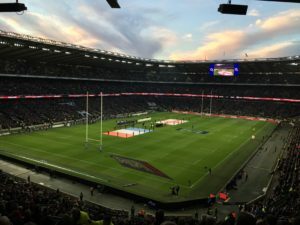 What was surprising for England supporters was that England’s Head Coach, Eddie Jones, was aware of this phenomenon and didn’t want it to affect his England players. In a business context, this ‘intuition bias’ creates an interesting paradox. For example, as a professional development firm, we tell our clients that, after acquiring the necessary skills and behaviours, the best way to ensure optimal performance in various business scenarios is to prepare, practise, role-play and simulate the expected interaction/presentation/situation, so when faced with the real-life scenario, your brain will remember how you reacted in the similar practice environment and you can perform to your best, avoiding any ‘amygdala hijack’ and ensuring that rational reactions outweigh the emotional. Yet, as demonstrated by the England rugby team example, when faced with a unique or unforeseen circumstance, too much practice can be detrimental to performance. As the well-known saying goes: a virtue has become a vice. Solving any complex problem (or identifying an opportunity) requires critical thinking – an ability to think clearly and rationally. Critical thinkers can understand the logical connections between ideas, identify, construct and evaluate different options for action, seek relevant sources of information and choose a final course of action based on rational judgment and sound reasoning. Good critical thinkers therefore need to be open-minded, cognitively flexible, habitually inquisitive, willing to reconsider and fair-minded in evaluation. It is easy to see how many hours of practice and running through the same anticipated scenarios time and again could lead to people acquiring opposite habits. That is, intuition replaces clear, rational, critical thinking. So how can top performing professionals stop intuition becoming a barrier to critical thinking? And how do firms ensure their experts can solve complex, unique and unforeseen problems as they arise? Clearly practice is essential and advocating less practice is not the objective of this article. Instead, firms and their experienced, high-performing teams need to reconsider how they practise. In a business context, rather than simply practising various scenarios again and again, managers should instead introduce unforeseen situations, spend time discussing with their team what alternative actions they might take, including what consequences might arise from each option and then once the scenario has been run, analysing what went wrong/right and how future efforts might be improved. By following this approach, rather than simply practising deliberately, high performing teams are also encouraged to ‘think deliberately’. Crucially, critical thinking skills are developed as well as critical performance skills. High performing teams in elite sports and business share two common traits: they prepare meticulously and practise fastidiously. Paradoxically, however, as we have seen with our England rugby team example, too much practice can sometimes have a negative effect on top performing teams, namely: intuition replaces the ability to think critically. A virtue becomes a vice. The onus is on coaches and managers to ensure their teams don’t simply practise deliberately but think deliberately throughout the practice. Elite performers need to constantly develop their critical thinking skills so that even if they face an extraordinary tactic (situation), they have developed the cognitive flexibility to think on their feet and solve the problem. For rugby aficionados: Italy instructed their players not to commit to the breakdown after the tackle. Which meant that there were no rucks and, because there were no rucks, no offside line. So their players were free to slip round the tackled man and stand guard either side of England’s scrum‑half, cutting him off from his team‑mates and blocking any potential pass. The analytical thinking programme enables participants to increase the power and effectiveness of their thinking and apply a consistent consultative approach to problem solving and opportunity generation.